Anyone interested in Oregon's coast should know about the Oregon Coastal Atlas. Whether your focus is history, environmental issues, shoreline changes, storm and/or tsunami planning, or photographic timelines, this site offers a plethora of data, and digital tools that bring it all to life. Some if the information is not available elsewhere. For example, their Estuary Data Viewer is the only place I've found that provides a township and range map layer for Bayocean. ﻿﻿﻿﻿When I had questions about using the Estuary Data Viewer, I was directed to Tanya Haddad. She developed and maintains the Oregon Coastal Atlas in one of her roles as Oregon Department of Land, Conservation, and Development (DLCD) staff assigned to the Oregon Coastal Management Program. 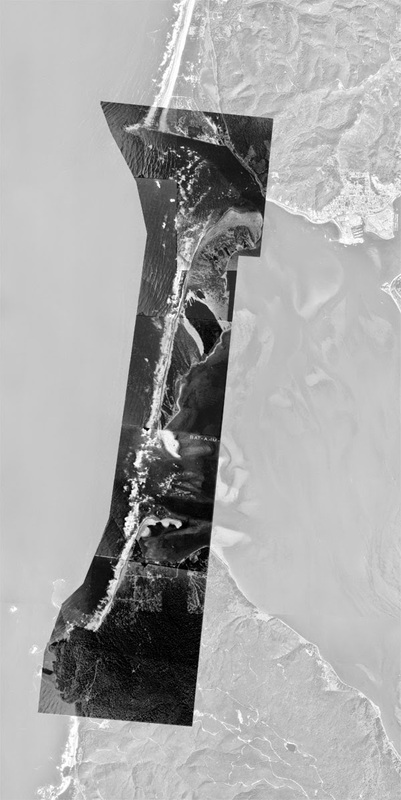 Back in 2002 Tanya created a web tool for Coastal Atlas called Tillamook Bay: The Erosions of Bayocean Spit . She took it down some time ago, but has just reposted it. I could only dream of being able to put something like this together, so I am very pleased she's done this. By moving your cursor across years ranging from 1939 to 1964 you'll see a series of aerial photos taken by the Corps of Engineers, visually depicting the slow destruction and eventual rebuilding of the spit. Enjoy it. Once The State decides if any building is going to happen again, they should sell a lottery with oceanfront lots as grand prizes. Phooey with Californian developers. Let working-class Oregonians have the land.